Recycle clean empty food cans into a delightful tin man for your home or garden. This is a guide about making a recycled tin man. I created this mini man from some recycled soup and coffee cans, soda tabs, funnel, bolts, screws, candy tins for feet, coat hangers, swivel, spray paint and tin snips. I used and awl and hammer to make the holes I needed. Tin snips were used to cut out hands and heart. I hang him in my garden. Here's a cute Tin Man made from recycled food cans. First spray paint all cans and paint nose and mouth and pop tops black. Then cut slits on both sides of medium can and insert tomato paste ears with glue. Make two holes in bottom of the medium can, then take the tuna can and poke two holes in top on both sides. Wire medium can into tuna can. Take a piece of wire and cut to length you want to hang with and double it and push up through the little part of the funnel. Make sure you make it long enough to wire through the medium can under the funnel to hold it together. Screw the funnel down thru the bottom of the medium can then screw in pop caps to make eyes. Take the 8 small cans and poke holes in top and bottom of all, wire two to gether to make four sets for arms and legs. Wire the arms into the top of the coffee can. Insert legs up thru bottom of coffee can and wire in. Poke 2 holes in each of the bottom of the sardine cans and wire onto bottom of legs for feet. Screw in the pop caps for buttons. You can go by the picture to see how to put him together. If you have questions post below. By Sandy from Bluff City, Tn. Where can I buy tin funnels to make a tin man? I live in the Vancouver area in BC. All I can find here are plastic ones. Thanks! If you still cannot find a metal funnel, maybe you can use metallic spray paint. I don't know how you'd need to treat the plastic, but I suspect there is a way to do it. Cute project, by the way! I found mine at an antique shop. I would look on Ebay, I have found all kinds of vintage kitchen stuff on there. Have you tried a store like Princess Auto or Peavey Mart, a place that sells farm/agricultural supplies? If you can't find a metal one, what about spray painting it with silver spray paint? I was thinking if all else fails and you can't locate one, it might be something to think about? My sister-in-law received, as a gift from one of her students, a Tin Man Birdfeeder made of used Tin cans. I would like to have instructions of how to make some. Go here for MANY, MANY bird feeders including a tin can one. Here is a pic I found!! I want one too! I have a friend who makes them, if you could send me your address I will pass it on to her. I too would love the info on making one of these !!! I have seen the tinmen for sale in the window here. 1. Open tops of each can and remove contents. Drain cola cans. Spray all cans and funnel with silver paint. Spray funnel inside and out. Let dry completely. 2. With an awl or ice pick, punch holes in vegetable cans, each side, 1/2" from top and bottom. Punch holes in the cola cans, each side, 3 1/2" from the bottom. Turn vegetable cans upside down over the cola cans until the first set of holes on the vegetable can meet the holes on the cola can. Run a 3 3/4" piece of wire through both cans; bend ends of wire. You have just made the arms and legs. 3. Turn sardine cans with open side down (feet). Place each leg combo on the backside of a sardine can. Run wood screw from open side of sardine can through bottom of cola can to attach feet to leg. 4. Turn the 32 oz. coffee can (body) upside down and punch a hole in the center bottom. Punch holes on each side, top and bottom, 1/2" from edge. Punch holes in the fruit can (neck) 2 1/2" from the bottom on each side, and one hole in the center of the bottom. Set neck right side up on the body. Bolt together using a screw and nut. 5. Punch holes in the 13 oz. coffee can (head) in the center bottom and on each side 1 1/2" from the open end. Cut a 20" piece of wire, bend one end. Run up through can, leaving bent end inside can. Drop funnel (hat) upside down over wire and let slide down to rest on top of the head. Curl the top of the wire; this will prevent the wire from coming out and will also be your tin man's hanger. Place the head down over the neck until the holes meet. Run a 4 1/2" piece of wire through the holes; bend at both ends. 6. Place legs inside open end of body and attach a leg to each side of the body by running a 7" piece of wire through holes. Bend wires at the end. Arms are attached to the outside of the body with a 13" piece of wire. 7. Glue the eyes approximately 1 1/2" from the top of the head. Paint nose, mouth, and ears. Three 1" crcles (buttons) are painted on body. All are black. A red heart is painted on the left side of the chest. Thanks I just wish we could see the feet. Where can I find the funnels for the tin man project? I cannot find the right size. Where can I find moveable eyes for making a tin man? Walmart in craft area and Dollar store has small bags of various sizes for eyes. 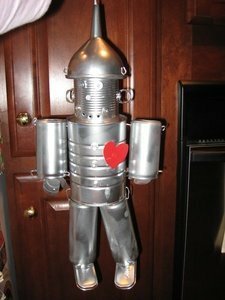 I am looking for craft ideas to make a tin man. This was a Contest Winner! Very Original! I am looking for instructions for making a tin man bird feeder. Does anyone have a pattern or instructions? 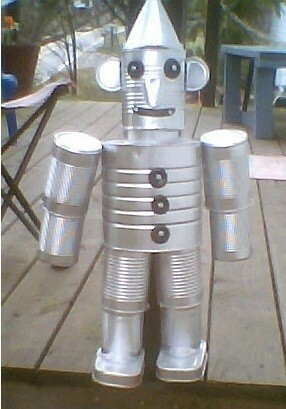 How do I make a Tin Man out of cans for a Wizard of Oz themed children's party? I'd use duct tape (aluminum colored) or that really shiny metal type tape that's the same size as a roll of duct tape. However, that can give cuts, so even though it's nice and shiny, maybe not. Use duct tape to make joints holding cans together. I am looking for directions with pictures for making hanging OZ tin man out of cans. Here are some instructions that may help with a picture. I have the instructions how do I get them to you? I don't have a scanner. OK here goes: 1 large coffee can, 1 28 oz. tomato can, 5 soup cans, 6 pop cans, 2 bottle caps, 1 wine bottle cap, 1 funnel, 4 rods for the shoulders, wrists, and knees. Cut out a heart in plastic and paint red. You will need 10 screws and 8 nuts. The coffee can is for the body, the funnel is the hat, the tomato can is the head, the soup cans are the neck, shoulders and lower legs. The pop cans are the lower arms, upper legs, and feet. You can figure out the rest I hope. I also have a tin lady if I can find it. Good luck. 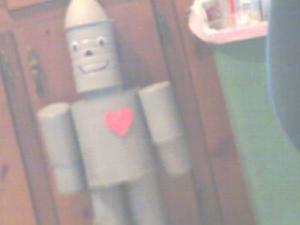 I need instructions for a man made from tin cans like in the wizard of oz. 1. Open tops of each can and remove contents. paint. Spray funnel inside and out. Let dry completely. cans, each side, 1/2" from top and bottom. Punch holes in the cola cans, each side, 3 1/2"
through both cans; bend ends of wire. You have just made the arms and legs. 4. Turn the 32 oz. coffee can (body) upside down and punch a hole in the center bottom. neck right side up on the body. Bolt together using a screw and nut. through the holes; bend at both ends. a leg to each side of the body by running a 7"
with a 13" piece of wire. top of the head. Paint nose, mouth, and ears.